This critter is big enough to gnaw off your thumb and finger without pausing. The Cypress Knee he’s perched on is about one foot tall, so you can see the perspective. There seems to be some meat on his bones, I mean, some guts in his exoskeleton. Hear that buzzing sound? They’re coming your way! 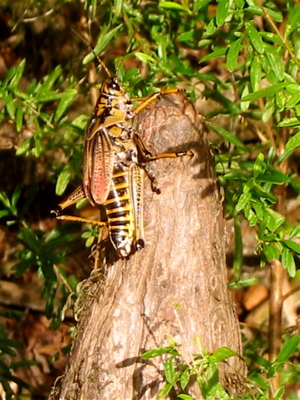 PS: I made up the name “tiger grasshopper” just because it’s descriptive.